← Claridges – a great local company, but do you remember Percy? 1:10,000 Ordnance Survey plan of upper Brownhills High Street and Ogley Hay from 1884. Some remarkable lost places. Image from NLS archive. Click for a larger version. 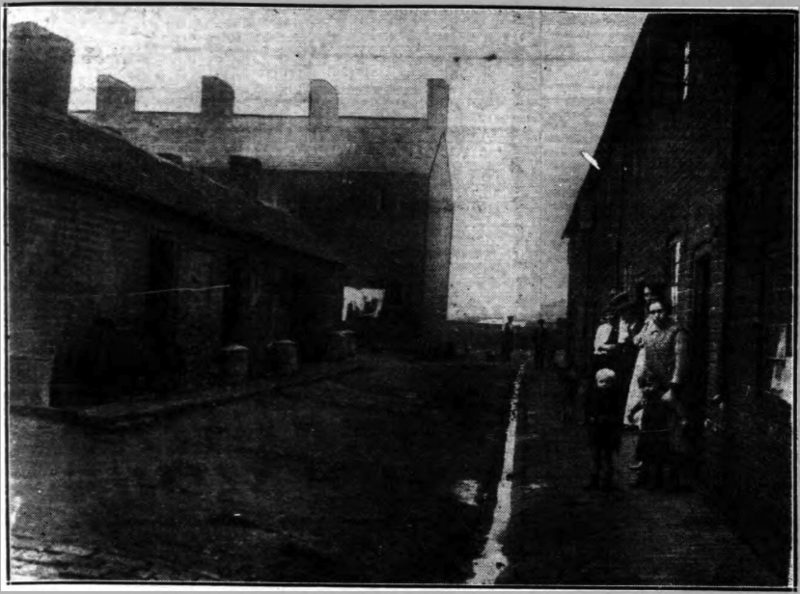 Specifically, when was the Metz, a courtyard of dwellings off Brownhills High Street, demolished? Also the same question for Ogley Square and Heath End’s poor dwellings? Chats with local people over a few years have brought contradictory views, suggesting that reliable details have been lost with the passing or time. I must confess, I’ve never heard of The Metz. Was it St. James Place, as shown on the map snippet at the top of this post? That would be about opposite where Silver Court is today. Not sure about Heath End, but we’ve covered Ogley Square and the notorious Hill Sisters from news reports of the time here before in 2013 – see the feature below, Ogley Square would be gone by 1937, to be replaced by the now also lost Wheatsheaf pub. That map though – some interesting places I never noticed. Seven House Row up on Lichfield Road? Vernon Lodge? Tory Row? Can you help David please? Thanks to the lad for a great enquiry. Comment here or mail me with what you know: Brownhillsbob at Googlemail dot com. Cheers. Ogley Square, as featured in a previous Lichfield Mercury article. BROWNHILLS PLAN TO WIPE OUT HOUSES. BIGGEST SLUM CLEARANCE SCHEME IN THE DITRICT. HOTLY OPPOSED BY THE OWNERS. ‘UNFIT TO LIVE IN’ SAYS URBAN COUNCIL. FOR THE PURPOSES OF HEARING THE OPPOSITION ON BEHALF OF THE PROPERTY OWNERS TO THE SUGGESTED SLUM CLEARANCE SCHEME AT OGLEY SQUARE, BROWNHILLS, A MINISTRY OF HEALTH INQUIRY WAS RE-OPENED AT THE COUNCIL OFFICES AT BROWNHILLS, ON TUESDAY MORNING. THE INSPECTOR CONDUCTING THE INQUIRY WAS MR. R.M. LOVE F.R.I.S.A., AND MR. NORMAN WAINE PRESENTED THE CASE FOR THE LOCAL COUNCIL. MR. W. FIELD INSTRUCTED BY MESSERS CRUMP AND JESSON, OF WALSALL) APPEARED FOR THE OWNERS. Mr. Waine said, in accordance with the provisions of the Housing Act, 1930, and in response to directions urged by the ministry, his Council had duly submitted to the Minister the five-year plan for the Brownhills urban district. The clearance of the areas known as Ogley Square was provided for in the plan, and his Council considered that the time had arrived when the provisions of the Act should be put into operation with regard to that area. HIS COUNCIL HAD RECEIVED FROM THEIR HELATH DEPARTMENT CERTAIN OFFICIAL REPRESENTATIONS, A COPY OF WHICH HAD BEEN DULY FORWARDED TO THE DEPARTMENT. AFTER HAVING CAREFULLY CONSIDERED THOSE REPRESENTATIONS HIS COUNCIL WERE SATISFIED THAT – AS REGARDS THAT AREA – THE DWELLING HOUSES WERE UNFIT FOR HUMAN HABITATION BY REASON OF DISREPAIR AND SANITARY DEFECTS. ALSO THAT THE HOUSE WERE DANGEROUS AND INJURIOUS TO THE HEALTH OF THE INHABITANTS OF THE AREA BY REASON OF THEIR BAD ARRANGEMENT. FURTHER THAT THE OTHER BUILDINGS IN THE AREAS WERE FOR A LIKE REASON SO DANGEROUS AND INJURIOUS TO THE HEALTH OF THE INHABITANTS. His council were unanimously of opinion that the most satisfactory method of dealing with the conditions in the area was in the demolition of all the buildings in the area. (1) The Council had caused the are to be defined on a map. (2) The Council had satisfied themselves that they could provide such accommodation (in advance of displacement) as would be necessary, and further to that the Council’s resources were sufficient for the carrying into effect of their resolution. (3) The Council had passed a Resolution declaring the area to be a clearance area. (4) The Council had transmitted to the Minister a copy of all resolutions passed by them with regard to this matter, together with a statement of the number of persons of the working classes occupying the buildings comprised in the area. (5) Notice of the making of the order and of the place where the order and map might be inspected was duly published in the prescribed form and manner. (6) Notice of owners, lessors and occupiers were duly served in accordance with Clause 2 (b) of the first Schedule to the Act. (7) With a view to the clearance of the area his Council by resolution duly made an order for securing the demolition of the buildings comprised in the area. The Order required that the buildings should be vacated within a period of six months from the date upon which the Order becomes operative. Continuing, Mr. Waine said that the area was more than eighty years ago an iron foundry, and now it comprised of thirty dwelling-houses built on .56 of an acre of land, thus giving a density of sixty houses to the area. In comparison the density of per acre for the whole of the Brownhills urban district was .67. The population of the area was 166 persons giving an average of 5.55 persons to each house, as against 4.53 for the whole district. The houses were badly arranged in that there was very bad congestion. In the centre of the common yard there were twelve w.c.’s and eleven communal wash-houses. Those structures were in a dilapidated condition and took up a considerable portion of the yard. The drainage of the common yard was very bad indeed, and light to the living rooms and bedrooms of certain of the houses was badly obstructed by the gable ends of others. In wet weather the common yard was nothing less than a quagmire. Without exception the houses were damp, the dampness being due to the absence of damp-proof courses, defective and porous brickwork or cement, rendering defective roof and chimney flashings and defective leaking roofs. In the majority of the casus the houses were over-run with crickets, blackbeetles and cockroaches and the house were below the general standard of working class houses in the district. There was a general lack of air space. The foregoing particulars, said Mr. Waine, were prepared for the original inquiry, and since that date the position had not improved by any means, it had degenerated very considerably, and the house were a good deal worse than they were then. There had been a suggestion made that the front block of houses in Ogley Road and either of the side blocks should be allowed to stand. His council Health Officers would not agree with that point of view. If they were allowed to stand it would certainly reduce the congestion to some extent but not nearly sufficiently. The Council would not consider 26 homes for the acre. The inspector: You are aiming at a density of 12 to 14. MR. WAINE: WE APPRECIATE TWELVE IS IDEAL FOR WHICH WE WORK FOR NEW PROPERTY. TWENTY SIX IS AGAINST MY COUNCIL’S OPINION, EVEN FOR OLD PROPERTY. APART FROM CONGESTION THE SANITARY INSPECTOR HAS ESTIMATED THAT FOR THE HOUSES SUGGESTED TO MAKE THEM HABITABLE THE COST WOULD BE SOMETHING TREMENDOUS AND IN THE REGION OF £1000. Mr. Hunt. Do you know this property is still in trust to the Hill family?- Yes. Do you know it was allocated to the misses Hill in November, 1933 – I can not recall it. Do you know it was allocated to them? – I knew those three ladies were the trustees. The first time any complaint was suggested against the property was in November, 1933. – I could not say that. Was that the first time it was made up? – It was the first time it came before the council for this purpose. Will you accept it was the first time the Misses Hill had any knowledge? – Yes. And at that time they had possessed it only since September, 1933? – If you tell me that I will accept it. On April 12th 1934, your Council made an order that the property should be demolished, subject to the consent of the Ministry? – Yes. And subject to the sanctions of the Ministry of Health and the approval of the District Valuer you agreed to buy it? – We did. Did you agree to pay £2,100? – Yes. You thought that the property was worth that figure? – We thought the property, including a large amount of land, was worth that figure. The council have not inflated ideas and have to be careful don’t they? – Yes, they have to be. When you offered that you must have put some value on the property? – A very small amount. Do you content the land in that part of Brownhills is worth £400 an acre. The Inspector: I do not think this is relevant. The price is bound up with the District Valuer. Mr Hunt (to Mr. Waine): Are you suggesting that land in that part of Brownhills is worth £400 an acre? – No. We considered the break-up value. I suggest it was much more than break up value. – The Council build by direct labour, and they would be able to use materials to advantage which ordinary builders would not be able to use. Would it be as much £1,000 for the houses? – I could not tell you. The houses had some value? – Yes. What value do you put on the houses? – I am afraid there was no definite intrinsic value placed on them. What value do you place on the land then? Mr. Waine: Must I answer that? The Inspector: No, I do not think you are called upon to do so. Mr. Hunt: I am asking him how he arrived at that figure. The Inspector: Mr. Waine has explained that it was the opinion of the Council as a whole. Is that not the position? Mr. Waine: Quite so sir. Unless you direct me I do not wish to reply to that query, because the question of land in Brownhills at the moment is a great point. I do not want to commit my Council or myself. Mr. Hunt: Will you write it down and avoid publicity? The Inspector: This inquiry is the reopening of an inquiry held in June last. I think all discussions as to prices of land are irrelevant. Mr Hunt: It is relevant. When the Council offered that figure they were allowing something for the property. In their mind the were not hopeless house that ought to be pulled down. The Inspector: I do not think there is much connection there. Whatever merits of demerits there were are eliminated and we start afresh. The object of the inquiry is to determine whether the house are fit or unfit. Mr. Hunt: I agree. Because they made a very substantial offer it must be that some of the houses were worth something. The Inspector: There were special reasons, I understand, why that figure was offered. Mr. Hunt (to Mr. Waine): It was not until October 18th you let us know the offer was off? – That is so. You made a counter offer. Do I take it is still open? – I could not say unless I have my Council’s direction. It is a misfortune for the Misses Hill – My Council appreciate it is a hardship. Presumably these are the worst houses in Brownhills? —- They are very bad, but are the only property to come before the Council as being suitable for inclusion in a slum clearance area. Mr. Hunt then asked Mr. Peacock (the Sanitary inspector) if it were better for the houses to have their own yards, even if they were very small, instead of a number of houses all using one big yard. Mr. Peacock said he thought it better for them to have one large yard, and he also admitted that arrangements could be made for paths to be made which would prevent the inhabitants of the houses having to walk on the yard, which in wet weather was a quagmire. Mr. Hunt suggested that if the back row of houses were pulled down then it would allow plenty of air space for the other houses, and as regards congestion, Mr. Peacock said that he would agree to twenty-six houses to the acre, although he thought it rather a large ratio. On re-consideration Mr. Peacock said that he thought twenty six houses per acre was much too high and withdrew his first statement. With regards to the question of the dampness of the houses, Mr. Peacock agreed to Mr. Hunts suggestion that the damp could easily be remedied, and he also agreed that the vermin may have been the result of the inhabitants, although the age of the house would make a difference. Dr. R. C. Bradford, in reply to Mr. Hunt said he could not complain if the houses in Mill Road were left standing, provided that two other blocks were pulled down, and provided they were required and made more habitable. Mr. Hunt Before there were only earth closets?—- Yes. They spent £300 twenty years ago and it was waste of money as compared with the improved conditions now? —- Yes. I am very sorry. Is it only in a few cases where houses in Brownhills, have damp courses? —- Yes, especially with old property. There must be a good many houses which are damp? —- Yes. And they are not being demolished? —- No. If the defects are remedied within a reasonable time you will be satisfied? —- If the congestion is relieved, and all the defects are remedied you might as well say if you erase Ogley Square and build a new one I will be satisfied. Since November, 1933, it is only reasonable that they have not any extensive repairs if the houses are to be demolished? – Yes, I agree. If I was a property owner and knew houses were to be demolished, I should do as little as possible. Mr. Waine, If two wings were left standing in good repair that would be satisfactory, – If in a perfect state of repair. Do you think that is reasonable to be done except at great expense? —- Certainly not. Frank Fox Harrison, the agent for the property said during the last fourteen years £1,779 had been spent on repairs on that property, and that was an average of £4 per house per annum. At the request of the Council they had erected inside privies, and the Sanitary Inspector said it would be a decided and lasting improvement. In his (witness’s) view it was quite reasonable for the three sides of that property still to remain. Houses 7 to 16 probably ought to go. There was garden land which was not included in the acreage, and if it was it would work out very favourably with any part in Brownhills. He did not agree in general that it was a congested area, and he know a great many worse areas. They had had continual trouble through children playing football and other games in the yard. It would be an improvement to have footpaths in the yard, and if he had been asked buy the Council he would have advised his clients to have them. The approximate net income was £200 per year. He did not agree that those houses were below the general standard of houses in the district, and as far as could be seen from the exterior he know of many similar houses in the district. A large majority of the property was quite capable of being saved. Have they been painted during the last twenty years? – Yes. I think it was about 1925. What do you attribute the defects to?- In some cases the tenants damage them. How much do you think it would cost to put the two blocks into condition? – I should think about £300. Mr. Hunt Submitted if the Order was confirmed it would be a real injury to the Misses Hill, who had only been responsible for the property since September, 1933. There were five ladies entitled to the income from the property, and they were entirely dependant on unearned income. They could imagine that their injury and serious effect on anyone who was dependant on unearned income such a depreciation would make. The owners had done what they thought was reasonable with the property. They had held their hands since November, 1933, realising it might, but hoped it would not go. Those houses have been and could be again perfectly proper places for habitation. The original article from the February 8th, 1935 copy of the Lichfield Mercury. Click for a larger version. This entry was posted in Bad Science, Brownhills stuff, Environment, Followups, Fun stuff to see and do, Interesting photos, It makes me mad!, Just plain daft, Local History, Local media, Local politics, News, planning, Reader enquiries, Shared media, Shared memories, Social Media and tagged 1883, 1:2500, bad housing, Brownhills, Brownhills local history, Brownhills Urban District Council, clearance, David Evans, Dr. Bradford, George Bradford, Hill sisters, Lichfield Mercury, Local History, Metz, Norman Waine, Ogley Hay, Ogley Square, Old maps, Ordnance Survey, Peter Cutler, Richard Burnell, Slum clearance, snaitationG, Staffordshire, Things to do, UDC, Urban District Council. Bookmark the permalink. 4 Responses to The Metz office? The author Flora Pearce who wrote Essie and No Work Today was brought up in Heath End. I believe that Flora was also school secretary for Walsall Wood High School. A reading of her book Essie offers an insight as to what life was like in Heath End. These houses were still part of the fabric into the late 50’s. We as children would go from the Moss Pitts over the railway stepping bridge and through this square of houses on route to Pelsall. Nothing changes with the Councils they still even now try to get their five pence worth. We have just been informed of another planning application for 3 … yes 3 houses on someone’s garden plot, two given permission and one pending … so what changes??? Edwina, are you seriously criticising the council for demolishing Ogley Square? If so, get a grip.